Learn the Tibial intramedullary nailing (suprapatella approach): Synthes Expert Tibial Nail. surgical technique with step by step instructions on OrthOracle. Our e-learning platform contains high resolution images and a certified CME of the Tibial intramedullary nailing (suprapatella approach): Synthes Expert Tibial Nail. surgical procedure. There are various ways to manage tibial fractures in general and compound tibial fractures in particular. Where the local expertise exists the council of perfection involves collaborative management by Orthopaedic surgeons and their Plastic surgical colleagues. Open fractures should be managed according to the British Orthopaedic Association (BOA) & British Association of Plastic, Reconstructive & Aesthetic Surgeons (BAPRAS) Audit Standards for Trauma [BOAST – Open Fractures; December 2017]. We present the case of an isolated open tibial diaphyseal fracture that has been stabilised with an Expert Tibial Nail. In a combined Ortho-Plastic approach, the wound is debrided and washed out prior to making a partial medial fasciotomy incision. Through this separate incision, the bone ends are delivered, debrided, washed out and the wounds then closed primarily. 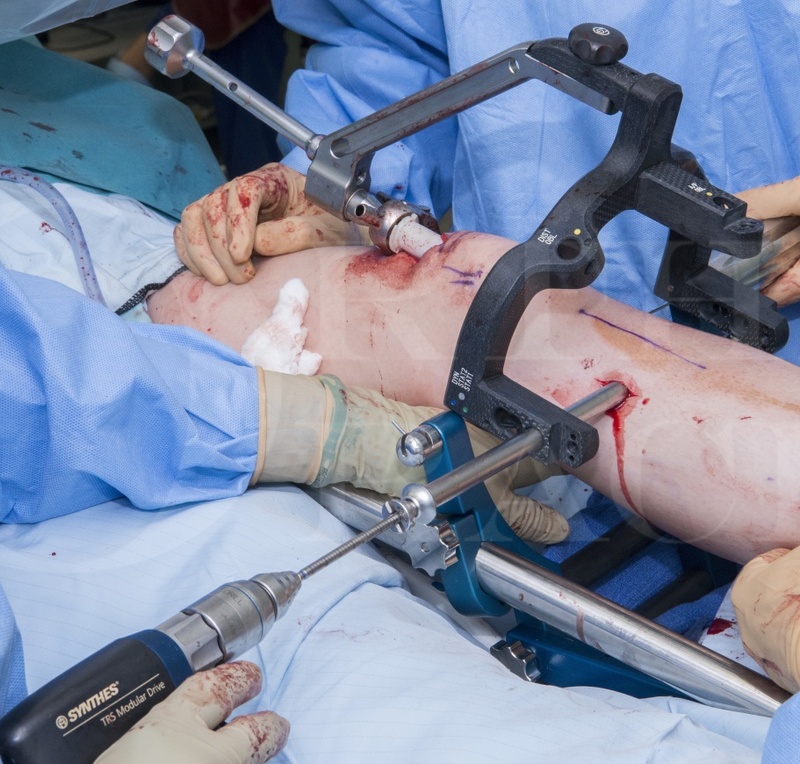 The fracture is held and reduced with the Staffordshire Orthopaedic Reduction Machine (STORM – designed and distributed by Metaphysis) and then a suprapatella tibial nailing is performed. A recent meta-analysis [Wang et al 2018] suggested that potential advantages of the suprapatella approach for tibial nailing might include shorter fluoroscopy time, reduced knee pain and improved knee recovery as well as more accurate fracture reduction compared to the more common approaches. The Expert Tibial Nail from Depuy Synthes is a titanium alloy nail which has advanced proximal and distal locking options that assist in the control and stabilisation of difficult fracture patterns. This allows either very proximal or very distal fractures to be controlled. Distally there is also a screw angle specifically for Tillaux type fracture fragments. Proximally there are also cancellous locking bolts that give enhanced bone purchase in this region. The insertion of an end cap locks the most proximal locking bolt and converts the nail / proximal locking bolt into a fixed angle construct. Depuy expert nails are available as both solid and cannulated nails. Importantly the ball tipped guide wire will pass through the nail, so that it doesn’t have to be exchanged after reaming and prior to nail insertion. For suprapatella nailing the same nails are used which means no additional implants are required (though there is a different insertion handle and instrumentation tray).